Parkinson’s disease is a chronic and aggressive neuro-dengerative disorder that occurs when there is a dopamine deficiency in the brain. The disorder is a constellation of debilitating symptoms that are continuous. Although the symptoms of the disorder can range from pre-motor effects to motor effects like stiffness, tremors, constipation and loss of muscle coordination, other problems and symptoms can appear as Parkinson’s progresses. Some of the symptoms are directly related to the disease, while others are amplified due to the natural aging process. Out of all of these problems, dental diseases, along with their associated problems, must be handled as quickly as possible so the patient is more comfortable. Some dental problems may occur because of the disease, and other become present as a result of the medication that is taken to manage the disease. In addition, some of the problems that are associated with Parkinson’s can make it challenging for patients to properly care for their teeth. Rigidity, tremors and other motor problems can make it very difficult for Parkinson’s patients to brush and floss their teeth correctly. If they do not receive proper assistance, they may become unable to take part in a routine daily dental hygiene program at home. As a result, they may suffer with tooth decay. There are also some drugs that are taken for the treatment and management of Parkinson’s can cause the patient to develop dry mouth, xerostomia. The diminished presence or lack of saliva in the mouth is one cause of periodontal disease and tooth decay. It is essential to have saliva in the mouth to keep bacteria from growing in the mouth. This bacteria can lead to tooth decay. If this is the case, the patient may be advised to drink water more frequently, place Vaseline on their lips and chew sugar free gum often to keep saliva levels high in the mouth. It is important that the patient does not smoke because smoking can make dryness increase in the mouth. Dental procedures that are necessary for the patient may become complicated to perform if the patient has extremely rigid muscles. Tremors and agitation can also make the completion of dental procedures difficult if the patient is not able to remain still. It is also common for some Parkinson’s patients to develop a sweet tooth. As they begin to increase their consumption of carbohydrates and refined sugar, their chances of developing tooth decay also increases. Drooling is another commonly seen symptom in patients with Parkinson’s. The disorder affects the patients ability to completely swallow the saliva out of their mouth. An accumulation of saliva can complicate sores and cracks on the sides of the mouth. If the cracks become infected, it can become difficult for the patient to eat or talk. The goal of providing dental treatments to Parkinson’s patients is to minimize the adverse outcomes of tremors and rigidity. It is also advised to avoid any drug interactions. The most important consideration for the patient with Parkinson’s is to maintain open communication about their dental health and the implications of dental disease. 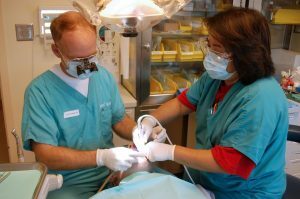 The dental team must also make an assessment to determine how well the patient can care for the teeth on their own, and if they could benefit from any dental aids and adaptations. These tools can aid in better self-care. Nutrition and diet counseling may also be beneficial. The dentist may also want to schedule the patient for more follow up appointments throughout the year. Whenever it is possible, self-care should be encouraged. However, it may be necessary to train caregivers and family members to ensure good oral hygiene is maintained. The treatment plan should always correlate with the level of motor and physical impairment the patient has. It is also important, however, that a pragmatic approach is taken with the patient’s dental health as soon as they receive a diagnosis of Parkinson’s. This will help to ensure that the patient’s oral health is cared for early before it is more difficult to provide care later on. All of the patient’s appointments should be booked at a time when the medications they are taking have reached optimal levels in their body. This generally occurs after 2 to 3 hours of taking the medicine. Mild sedation and soft restraints on the arms may help mitigate any undesired movements like tremors during treatment. It may also be necessary to cradle the patient’s head to provide more stability during treatment, and mouth props may also be used during treatment. If there are impaired swallowing capabilities in the patient, airway protection can be used. Rubber dams are commonly used in these types of cases. A rubber dam will help to minimize any risk of pulmonary aspiration due to debris and/or saliva. Patients with Parkinson’s require special considerations during in-home dental hygiene and during professional dental visits. You should speak with your dentist ahead of time to discuss any special requirements and considerations. Each case must be diagnosed and treatment should be personalized on the patient’s particular needs. Parkinson’s disease is a condition that is experienced by 1 person out of 1000 in the general public. Most cases of this disease involve adults over the age of 40 and the symptoms usually are at their height over the age of 55. There is, however, a form of this disease that does happen in teenagers. Here we will take a look at Parkinson’s disease and facts to consider. In the simplest terms, Parkinson’s Disease is a progressive disorder that affects bodily movement. Being progressive means that for most patients the condition will get worse with each passing year. At present, it is not known what causes this condition and there is no cure for it. There are treatments that have shown themselves as effective to varying degrees depending on the patient. Included in those options are surgery and medication. This condition leads to certain types of nerve cells in the brain dying. These nerve cells are known as neurons and these cells are used by the brain to promote dopamine which in part, helps to control coordination and movement. Once dopamine is not being produced at a normal rate, then the person begins to be unable to control certain types of movement. Those who suffer from this disease will begin to experience stiffness in their arms and legs and reduced coordination. Many will also have uncontrollable tremors in their face, arms, hands, and in their legs. Those with this disease can often have their sleep disturbed. They may find that they wake much earlier in the morning than they would like and they may experience terrifying nightmares. Many of the patients will have very restless sleep and a number of sleep disturbances. This disease causes the body to experience a great deal of fatigue and the combination of these things can lead to other problems such as amnesia and difficulty with understanding others or being unable to think clearly. Because of the spasms that are related to this disease, some patients will find that there are times where they can’t speak correctly because their voice box is experiencing spasms. Some will have urine that leaks and many will have regular constipation. At this time it is not understood the exact cause of this disease. But there are certain risk factors related to this condition. The younger a person is the less likely they will experience PD. The majority of cases occur in people over the age of 40. The highest percentage of people who develop this disease are over the age of 60. If anyone in your family has had Parkinson’s disease, then it means that you have a higher risk factor than those who do not have anyone in their family that has had the disease. If there’s only one person known to you in your family that has had this disease, then the chance of you getting it is still very small. The chance of getting it is only significant if there are more than one family members who have had PD. The majority of people with Parkinson’s disease are men, and women are significantly less likely to get this disease. There is some evidence to suggest that men who are exposed to pesticides and herbicides are at a greater risk than those who have not. One of the situations that is often overlooked is how to manage someone with Parkinson’s disease when they go to a dental appointment. Because these individuals suffer from uncontrollable tremors, then it will be necessary for the dentist to understand exactly how to carry out dental procedures with the risk of sudden and uncontrollable tremors. This disease leads to a number of difficulties for the person who is suffering from the disease in the care of their teeth. Patients who suffer from this condition may find it difficult to brush their teeth because of the uncontrollable tremors. This disease causes memory loss and the inability to think clearly and this can mean that the patient forgets to brush their teeth. It also causes a feeling of burning in the mouth which can then spur the patient into seeking dental assistants. A dentist will need to assist the patient in determining how they can manage their oral care. The patient will have muscle rigidity along with the tremors mentioned above that all lead to the likelihood of poor oral hygiene. The dentist should recommend tools to help the patient to get a better result. Aspirating or electric toothbrushes along with fluoride rinses that have higher concentrations of fluoride are some of the things that dentist might recommend. PD is a disease that will likely require the sufferer to have family assistance at home. It can be managed and family members should seek professional advice. Treatments are available and are improving.